Chromogenix Coamatic® Heparin is a chromogenic assay kit for the quantitative determination of unfractionated heparin (UF Heparin) or low molecular weight heparin (LMW Heparin) in human citrated plasma using automated and microplate methods. Reagents, Packaging, Storage, Stability The sealed reagents are stable at 2-8°C until the expiry date printed on the label. S-2732™, 15 mg, 2 vials. Chromogenic substrate, Suc-Ile-Glu(-pip)-Gly-Arg-pNA·HCl lyophilized with detergent and mannitol as bulking agent. Stability after reconstitution: 3 months at +2-8°C in the original vial. Avoid exposure to light. Discard the substrate solution if it appears yellow. Avoid contamination by microorganisms. Factor Xa, 35 nkat, 2 vials. Lyophilized bovine FXa containing Tris buffer, EDTA, NaCl, dextran sulfate and bovine serum albumin. Stability after reconstitution: 3 months at +2-8°C in the original vial. Inhibition of FXa by the [AT · Heparin] complex. Reaction of FXa with S-2732™ resulting in cleavage of pNA. The pNA release measured at 405 nm is inversely proportional to the heparin level in the sample. In order to reduce the influence from heparin antagonists, such as platelet factor 4 (PF4), dextran sulfate is included in the reaction mixture. Heparin is the most frequently used antithrombotic therapeutic. The biological activity of this sulfated glycosaminoglycan resides in its ability to accelerate (up to 2000-fold) the inhibitory effect of antithrombin (AT) on the coagulation proteases. The amount of LMW Heparin or UF Heparin is determined from the anti-FXa activity expressed by the [AT · Heparin] complex formed in plasma. 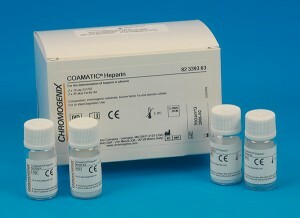 Coamatic© Heparin measures the ability of heparin to catalyze the inhibition of FXa by antithrombin. The anti-Xa assay is the method of choice when monitoring LMW heparin therapy and is also suitable as a replacement for the APTT test when monitoring therapy with UF Heparin. Simplified Heparin testing, undiluted assay with superior reagent stability.